A cramped and dated kitchen was completely removed. New custom cabinets, built-in wine storage and shelves came from the same shop. Quartz waterfall counters were installed with all-new flooring, LED light fixtures, plumbing fixtures and appliances. A new sliding pocket door provides access from the dining room to the powder room as well as to the backyard. A new tankless toilet as well as new finishes on floor, walls and ceiling make a small powder room feel larger than it is in real life.After David laid out the new cabinet and counter arrangements and planned for amenities such as recessed LED light fixtures and a new exhaust duct to the roof, the owner assembled her favorite materials into a carefully composed collage of floor tile, quartz counters, travertine backsplashes, wooden shelves and stainless steel appliances and fixtures. 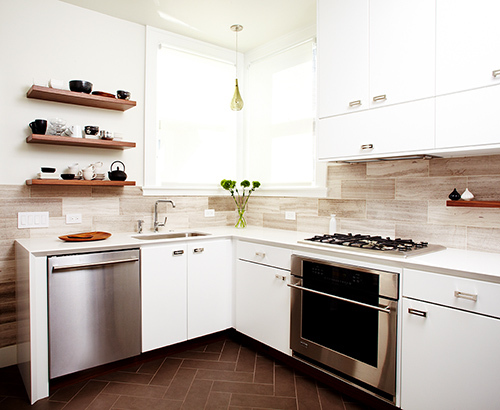 The goal was to have a predominantly white kitchen but to enliven it with subtle patterns in the tiles. The backsplash is silver travertine.